A truck used to carry sand for fracking is washed in a truck stop on February 4, 2015 in Odessa, Texas. Just as new scientific reports are reinforcing links between fracking and earthquakes, Texas legislators are moving to limit cities’ control over oil and gas drilling in their communities. The proposed law is worrying not only environmentalists but also some officials who say local control is the best way to protect people from earthquakes, polluted water and other possible effects of fracking. A bill that passed overwhelmingly by the House of Representatives earlier this month and is now being considered by the Senate would allow only the state to regulate oil and gas operations. Republicans have a majority in both bodies. Municipalities would be permitted a say over activity above ground, including fire protection and other emergency responses, noise, traffic and setbacks but only if restrictions are “commercially reasonable." With real-time monitors, scientists have linked a swarm of small earthquakes west of Fort Worth, Texas, to nearby natural gas wells and wastewater injection. Supporters say the bill has been amended to reflect some concerns raised by municipalities. For example, they say it would ensure that the commercially reasonable provision is determined objectively by specifying that it is what a reasonably prudent operator would do. But critics say that standard remains unclear and is open to legal challenges. A public hearing on the Senate bill was held by the Senate Natural Resources Committee Thursday in Austin. The committee approved the bill by a vote of 9-0. Many Texans do not agree with the direction the lawmakers appear headed. A University of Texas poll released on Wednesday found that among those who are familiar with the term fracking -- and fewer than half of Americans are -- a majority support allowing cities to ban franking within their borders. Fifty-eight percent of Americans and 53 perent of Texans say cities should be permitted to outlaw its use. “At present, it appears a large majority of Americans think cities should have the right to decide if they want to ban fracking locally,” Sheril Kirshenbaum, the director of the University of Texas Energy Poll, said in a statement. The new law was proposed after the passage of the state’s first fracking ban, approved in November in Denton when anti-fracking activists convinced a majority of the city’s voters to support it. A special panel forum will be held Wednesday night for residents of Reno and Azle, where earthquakes have recently been reported. Legislators said they are spelling out the state’s authority so as to continue the efficient management of an industry that has brought prosperity to Texas. The Texas Railroad Commission, the regulatory agency over the oil and gas industry, would have the ability to preempt local rules. The Texas Oil & Gas Association has argued that fracking bans represent a taking of property without compensation in violation of the Texas constitution. “Inappropriate use of local ordinances to stop oil and gas production also threatens resources for public schools, universities, roads and essential services that are directly funded by production taxes paid by the oil and gas industry,” Todd Staples, the association’s president, said in a statement in March. But others say local control is the only way to protect groundwater, public health and safety. Dallas Mayor Mike Rawlings said that he was concerned about the legislators’ efforts to curtail local control in light of studies showing fracking and its associated waste disposal wells significantly increase the risk of earthquakes. By requiring that all local ordinances meet a "commercially reasonable" standard, "The bill puts local fracking ordinances in the hands of the lawyers and judges for the near future," he said. “This is further evidence that local leaders ought to be the ones deciding what is best for the health and safety of their citizens,” he said. His counterpart in San Angelo, Mayor Dwain Morrison, said that the bill that was passed by the House went too far. He said he was not convinced by the studies linking franking and earthquakes and did not want to stop oil and gas production. But he thought cities needed more control over where fracking was done. 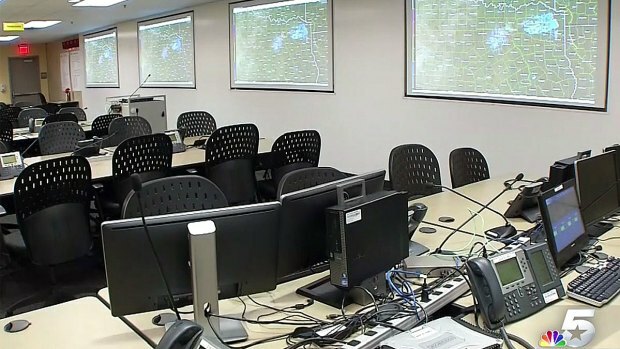 A group from the Azle area will head to Austin Tuesday morning to address the Texas Railroad Commission meeting about the recent earthquakes in the area. And in Fort Worth, Mayor Betsy Price said that the city had worked hard with the bill’s sponsors, Rep. Drew Darby and Sen. Troy Fraser, and the Texas Oil & Gas Association to ensure that local ordinances would be preserved. The bill had come a long way, she said. Melinda Taylor, the executive director of Kay Bailey Hutchison Center of Energy Law and Business at the University of Texas, said that among states with significant fracking, Texas was the only one without a law to protect property owners from damage from drilling, whether a Fort Worth homeowner or a West Texas rancher. The only recourse they have had until now has been whatever local restrictions are in place, she said. 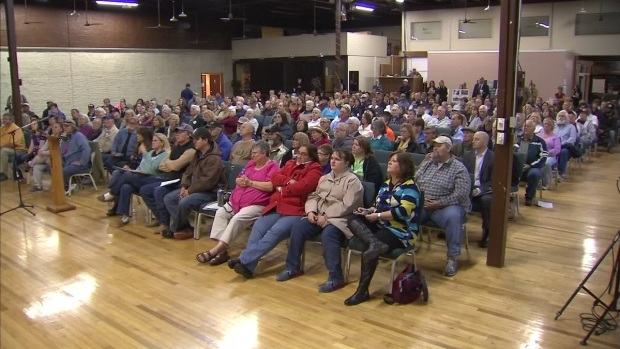 The Earthworks Oil & Gas Accountability Project, the North Central Texas Communities Alliance and former Dish Mayor Calvin Tillman hosted a public meeting in Azle. Two earthquakes were reported in the area along the Tarrant-Parker County line in three days. Fracking or hydraulic fracturing is a process used to maximize the extraction of oil and natural gas. A mixture of water and chemicals is pumped into wells at high pressure to fracture the rock so that oil or natural gas can flow, according to the U.S. Environmental Protection Agency. Once the fracking is completed, the fluids may be injected into waste-disposal wells. Texas Comptroller Glenn Hegar said in a statement at the beginning of the year that 1.1 million jobs had been created since the recession, partly as a result of the oil industry. “This was partly attributable to the recent shale oil boom in Texas which helped counterbalance a sluggish national recovery and weakness in other sectors of the economy," he said. 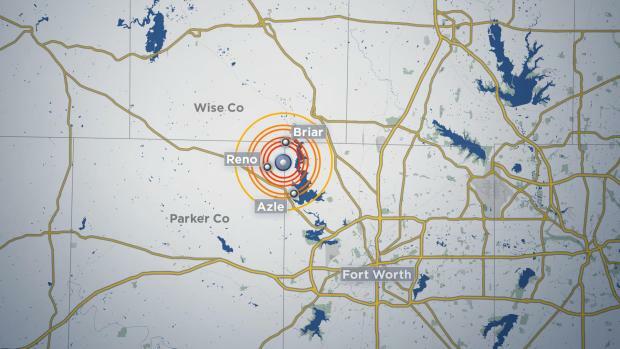 Residents and scientists are looking closely at a cluster of earthquakes that have shaken homes in the Azle and Reno, TX areas. Oil production and regulation taxes are projected to generate $5.7 billion, a 14.3 percent decrease over the current two-year period; natural gas production tax revenue is expected to be $3.2 billion, an 8 percent decrease, he said. Adam Briggle, a vice president of the Denton Drilling Awareness Group, said that the House vote was disappointing but predictable. His group is continuing to lobby against the bill. “I think that really this is a situation where folks are voting on the basis of powerful special interests rather than making common-sense public policy,” he said. "We've had local regulations working on oil and gas and the industry has been quite successful for the past several decades." Luke Metzger, the director of Environment Texas, said that since the Denton vote the oil industry has been trying to wrest power from municipalities. City regulations have governed how close to homes and schools drilling can take place or kept waste injection wells outside city limits. "Those kinds of protections really have been the one thing standing in the way from some of the worst impacts of dirty drilling," he said. Other states have taken a different approach. New York's highest court for example ruled last year that municipalities have the authority to ban fracking. The Texas lawmakers’ effort to tighten control comes amid new evidence that fracking is likely causing the swarms of earthquakes occurring in Texas and other states. One study published last week concerned earthquakes around Azle from November 2013 to January 2014, that were monitored by scientists at Southern Methodist University, the University of Texas and the United States Geological Survey. They concluded that removing saltwater from the natural gas wells and injecting the waste water back underground represented the most likely cause of the 27 earthquakes, all magnitude 2 or above. After its release, the Texas Railroad Commission's seismologist, Craig Pearson -- who in the past has resisted expanding studies into the causes of earthquakes -- questioned its methodology and conclusions. 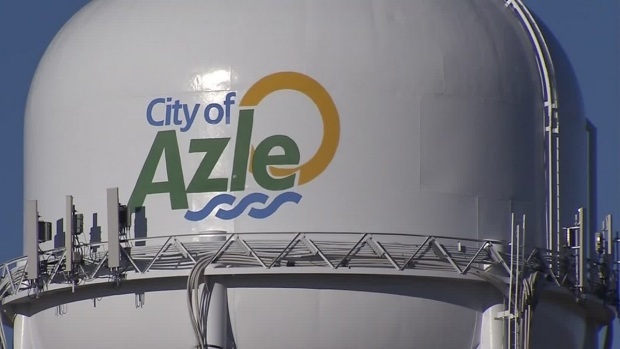 Since then the Texas Railroad Commission has ordered the companies running two waste water disposal wells near Azle to show why they should remain open. 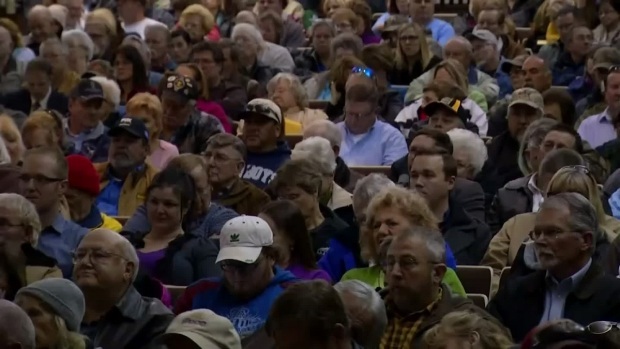 The commission has had rules in place since last year allowing it to shut down a well if there is scientific data that it is likely to be or has been determined to be contributing to seismic activity. Meanwhile in Oklahoma, the Oklahoma Geological Survey acknowledged that most of earthquakes shaking the state were very likely caused by the underground disposal of waste water from oil and gas wells. It is a turnabout for Gov. Mary Fallin, a Republican, who had been saying that more study was needed.